No ordinary stoves, these are godsend for rural women. The low-cost elongated stoves with two cells help save precious fuel wood in an area already stripped of trees. They are also a boon to women such as Rozan Nazar, who no longer have to walk five km, at times more, every day to collect firewood. Octogenarian Fatema Hasan recalled that there once was a jungle around her village. "We didn’t have to walk that far. But today these women have to walk such distances because we cut down trees and did not plant any to replace them," said Hasan. On the average, a woman would be spending 15 hours a week collecting wood. "It used to take me between two and three hours just to collect wood which is good for a day, sometimes two," said Nazar. "You can’t imagine how much of a relief this is. My life has eased so much." The other women nod in agreement. They spend the extra time they get doing embroidery, chatting with each other. "I love that! We never had time to do that earlier!" Nazar exclaimed. Siddiqi is enjoying being in the limelight for her stoves: "I didn’t know I could be good at anything." She first learnt about the energy-efficient, smokeless stoves through a team from the non-government Indus Development Forum (IDF) that came to their village to do a demonstration. "I volunteered to construct one after they demolished their sample," said Siddiqi. This was nine months ago. She has so far constructed 16 stoves, and for every stove she receives 50 Pakistani rupees (58 U.S. cents) from the forum. It takes her half a day to build a stove, including digging up the soil, mixing it with other materials and then installing the stove. "It takes three days for it to be completely dry," she said. Each stove uses about 15 kilograms of soil mixed with rice husk, wheat straw and donkey excreta. "It has to be donkey dung, not buffalo, because the latter burns and is not strong enough to sustain heat," said Javed Shah, the man who invented the smokeless stove. "It’s not rocket science, really," said Shah, a technical adviser with the Aga Khan Planning and Building Services (AKPBS), a non-government organization that works for the improved living conditions of communities. Apart from soil, making the smokeless stoves also involves using the wooden template that is provided by the IDF, two empty tin canisters, a small plastic tub, an empty plastic liter-size soda bottle and a clay pipe that acts as a chimney. "Training people, especially women, was part of the project," said Hameed Sabzoi, IDF director. The project was sponsored by the small grants program of the Global Environment Facility of the United Nations Development . Under the one-year project from December 2008 to 2009, IDF had pledged to install 1,000 stoves in 15 villages in Gharo. The union council has a population of about 18,000 to 20,000 and comprises 35 villages with 50 or more households each. The organization at first wanted to charge 50 rupees for the installation of each stove, but soon realized that the poor villagers could not pay even the small amount. "We then decided to provide the stoves for free," said IDF’s Sabzoi. Shah first came up with the idea of energy-efficient metal stoves for the northern areas of Pakistan in 1985. "Conditions like asthma and eye infections among women and children were phenomenal in that area," he said. "We realized it was due to smoke and soot." Biomass fuel - wood, crop residues and animal dung - is used in four-fifths of households in Pakistan and is a major source of indoor air pollution when burnt for cooking, for providing heat and lighting up homes, according to Sabzoi. In 1987, while working in the villages of Sindh’s coastal area, Shah realized that women were facing similar health problems there. "But the weather did not permit the use of metal stoves. It would get very hot in these villages in summer," he said. So, Shah came up with stoves that used local soil. "We succeeded in installing some 890 stoves (in the 15 villages in Gharo)," said Sabzoi. Noor Khatoon, a 40 year-old mother of four, said she preferred the new stove: "It takes less time for the food to get cooked than in the traditional one." Her cousin Dhaniani will get a smoke-free stove after the family finishes reconstructing their home, which was flooded during heavy rains last year. 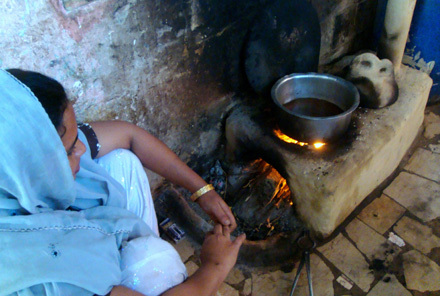 When she tried cooking on Khatoon’s stove, she found that it took almost half the usual time and used very little wood. The food was tastier too, especially the roti, Khatoon added. "That’s because the heat is evenly distributed all around the pan, unlike in the traditional one," she explained. “Some residents have added further innovations in their stoves. A copper coil connected to the side of the combustion chamber and connected to a barrel of water warms the water so it can be used for bathing especially during winter,” said Sabzoi. Roma Juma, 37, was using the energy-efficient stove long before the IDF team came to her village in Mohammad Hashim Katchi Mundro. She has warm water available all the time. The seamstress now takes orders and builds stoves for her neighbors. "I did it for free in the beginning, but when more and more women started coming with similar requests, I decided to charge them," said Juma. She charges 100 rupees (1.17 dollars) for her labor and has so far built about 150 stoves. Her relatives in Karachi have asked her to build them some too. "They say their gas and electricity bills have skyrocketed, and they want me to go there and install the stoves for them," she chuckled. An evaluation by the Aga Khan services in 2005, called the smoke-free stoves a "runaway bestseller" that has helped reduce wood use by 40 to 45 percent. Masood Mahesar, a development worker and former provincial manager at AKPBS-Pakistan, said more than 10,000 stoves have been installed in Sindh’s Thatta, Badin, Hyderabad and Matiari districts. "A few thousand have also been replicated by the communities themselves," he told IPS. But this is a drop in the ocean in a region of 50,000 villages. Thousands remain unaware of the stove and either cut trees or pay 250 rupees (nearly 3 dollars) for 40 kilos of expensive fuel wood.